The euro finished last week three standard deviations below its 20-day moving average. Even though the returns in the foreign exchange market are not normally distributed, this is a rare event, and reflected the stretched technical condition of the dollar following the stronger than expected US jobs data. 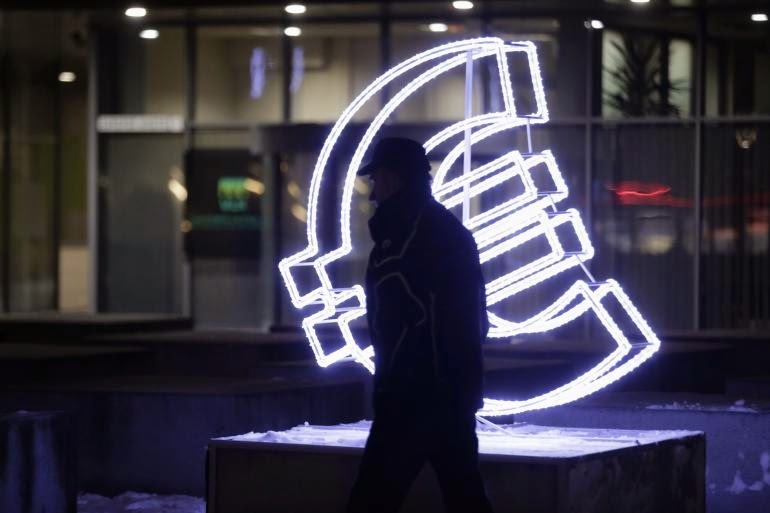 After a slow start in Asia, the euro climbed from a little below $1.0825 to $1.0900, were sellers awaited. The other major foreign currencies also edged higher against the dollar, with sterling matching the euro's gain. It pushed through the $1.51 level in the European morning, but ran out of steam in front of the first retracement objective the losses seen at the end of last week (~$1.5515). The dollar consolidated its recent gains against the yen, even though Japanese data were disappointing and the Nikkei fell by nearly 1%. The 10-year JGB yield rose 3 bp to almost 42 bp, which is the highest since February 17. Japan revised lower Q4 GDP to 0.4% from 0.6% quarter-over-year, with the annualized pace slowing to 1.5% from 2.2% of the initial estimate. The deflator ticked up to 2.4% from 2.3%. This is mostly a reflection of the sale tax increase last April. It will drop out of the base effect shortly, and this is encouraging speculation that the BOJ will have to take more action if the inflation target is to be realized. Separately, Japan reported January's current account surplus of JPY61.4 bln. This is much smaller than expected. Yet it is the first January current account surplus in the month of January since 2011. However, the trade deficit was smaller than expected at JPY864 bln. The consensus expected a JPY936 bln shortfall. The other major component of the current account is the investment income balance. It stood at JPY1.41 trillion. Germany reported a smaller than expected January trade surplus. The 15.9 bln euro surplus compares with the consensus forecast of 19.5 bln euros. Exports fell 2.1% against a consensus forecast of a 1.5% decline. Exports in December were revised to a 2.8% gain from 3.4% initially reported. Imports were also weaker than expected. They contracted 0.3%. The market had expected a 0.5% expansion. Despite the smaller trade surplus, the current account surplus of 16.8 bln euros was slightly larger than expected, but down from the revised 25.6 bln surplus recorded in December. The ECB launched its sovereign bond buying program. The market expects about 10 bln euros of sovereign bonds will be bought this week. Market talk suggests German, French and Italian bonds have been bought today. European bonds yields are lower across the board, with 10-year German and French yields off 4-5 bp, while peripheral yields are off 1-2 bp. Of note, the Austrian banking woes, leading Moody's to cut the Carinthia regions rating by four notches, does not appear to be impacting the trading in Austrian national bonds. The 10 year-yield is off 5 bp to 41 bp and the 2-year yield stands at almost -16 bp. The Eurogroup of finance ministers meet today to discuss Greece's latest proposals. Eurogroup head Dijsselbloem already pronounced preliminary judgment that while the proposal are serious they are not sufficient. The proposals are reportedly different from early iterations, and this gives the bureaucratic/technical reason to pursue more technical discussions before making any disbursement. It is not clear what to make of Varoufakis's interview in an Italian newspaper over the weekend, threatening a referendum if its proposals are rejected. Ironically, the proposals are not that radical, and many seem to be similar to what the previous governments have proposed but failed to implement. The government has backed down on its initial intent to reverse existing privatization deals, though the electric grid was in an early state of negotiations. It is not clear that the government is keen to proceed. The Greek government also appears willing to accept that the concessionary VAT rates in the Aegean Islands must end. It also seeks to restore the independence of tax collection, the head of which the Samaras government had dismissed. Remember when the Greens first emerged on the political stage in Germany? There were two wings--the realos and the fundis. The former sought to influence policy and the latter wanted to preserve their "clean hands" and principles. The same split can be found in Syriza's coalition. A full third of Syriza appears to be like the fundis, while Prime Minister Tsipras himself seems to be a realos, but Finance Minister Varoufakis aligns himself with the fundos. The North American economic calendar is light. The main feature is the Federal Reserve's Labor Market Conditions Indicator. It is a new indicator and tends not to move the markets. The fact of the matter is that the February employment report renewed market expectations for a Fed rate hike by the end of summer. There now appears to be a consensus that next week's FOMC statement drops the "patience" forward guidance. Three regional Fed Presidents speak today, but two Kocherlakota (dove) and Fisher (hawk) are stepping down shortly. Mester from Cleveland speaks this afternoon and is expected support ideas that a June hike is a real possibility.